The principal bonds used in brickwork were described in Part I., but there are one or two varieties not so commonly used which remain to be noticed. Raking Bond is of two kinds, Diagonal and Herring-hone. In both the bricks in the interior of the wall are placed in directions oblique to the face. A course or two of raking bond is sometimes introduced at intervals in thick walls built in English bond. 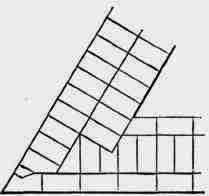 The proportion of stretchers in a brick wall diminishes according to its thickness (see Part I.) The raking courses are therefore useful in giving longitudinal strength to thick walls which are deficient in stretchers. In both kinds of raking bond alternate courses rake in opposite directions. In this the bricks (except those in the faces of the wall) are laid diagonally, at such an angle with the face that the bricks will just fit in without being cut. A two-brick wall is the thinnest in which this can be done, and then only in the stretching courses. In thicker walls diagonal bond may be inserted in any course. The triangular spaces at the back of the facing bricks are objectionable ; it takes some trouble to cut a piece to fit them, and they are therefore frequently left empty. 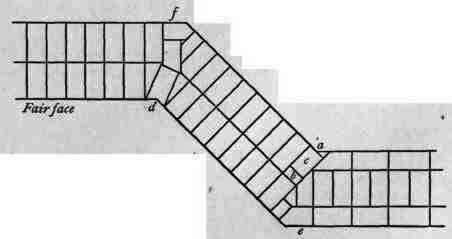 Herring-bone Bond consists of bricks laid raking from the sides toward the centre line of the wall, as shown in Fig. 25. This is a defective bond, for, in addition to the triangular spaces at the back of the facing bricks, there are likely to be voids, each larger than half a brick, left in the centre of the wall, unless great care be taken to have them properly filled in. Herring-bone courses cannot be introduced at all in walls less than 3 bricks thick, and only in the stretching courses of such a wall; in thicker walls, however, this bond may be introduced in any course. 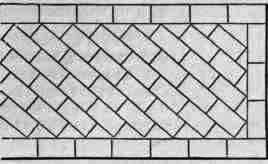 Flemish Garden Bond contains in each course one header to three or four stretchers. The object in each case is the same, to show as few headers as possible, in order to get a fair face on both sides of walls 9 inches thick, for which such bond is chiefly used. This would not be possible if there were many headers, because ordinary bricks vary so much in length. Bond Courses of superior construction are sometimes built into inferior walls to strengthen them. Thus courses of brickwork may be built into walls of flints or rubble, and are called lacing courses. 1 Known also as Scotch Bond and in some localities as Common Bond. - Seddon. Brick Piers are generally rectangular, and may be built either with or without reveals. Fig. 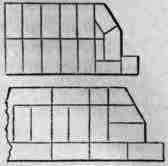 26 is a plan of one course of a pier 18 inches square, without reveals, built in English bond. The next course is precisely similar as regards bond, but is placed at right angles to the first, being turned round so that the side a b in the course coincides with b c in Fig. 26. The same remark applies to Figs. 27 and 28. Fig. 27 is the plan of a pier 2½ bricks square, and Fig. 28, of one 3 bricks square, both in English bond. It will be noticed from these figures that in piers whose sides are equal in length to an even number of half-bricks (Figs. 26 and 28) all the bricks of the stretching courses are whole bricks, but when the sides are of a length equal to an uneven number of half-bricks (Fig. 27) a line of half-bricks or of headers must be introduced in each stretching course. 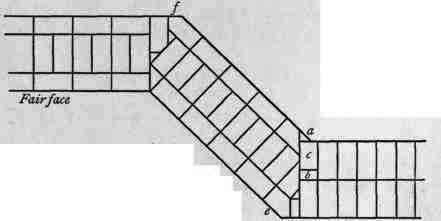 The methods of arranging the bond for walls meeting at a right angle, as is most commonly the case in buildings, have been explained in Part I.; an illustration will now be given of the bond for walls meeting at an inclination greater or less than a right angle. Figs. 29 and 30 show two 18-inch brick walls meeting at an obtuse angle. There are several ways of forming the bond, but the arrangement shown is a good one. The bird's-mouths a and d and the squints e e, Figs. 29, 30, may be "cut and rubbed " as "axed fair," or specially moulded. The squints ff would be "rough cut." To avoid cutting the bird's-mouth in the brick at the re-entering angle, the little triangular points a are often very improperly put in as separate pieces, in which case the bat b is not required, b and c being replaced by a whole brick. In Figs. 31 and 32 two 18-inch brick walls meet at an acute angle. The bonds shown involve a good deal of cutting, which is inevitable to form really good work, but much of it would be omitted in ordinary building, the resulting gaps and spaces being filled in with bits of brick bedded in mortar. Reveals with Splayed Jambs.1 - Splayed jambs in brickwork-are weaker than square jambs, and should only be used where there is a good interval between the windows. Figs. 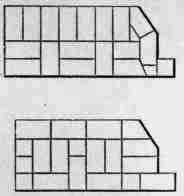 33, 34, are plans of the alternate courses of a reveal with splayed jambs for a 14-inch (1½-brick) wall in English bond. 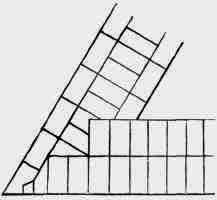 Figs 35, 36, are plans of the same in an 18-inch (2-brick) wall. English Bond. 1 ½-Brick Wall. Figs. 33, 34. 2-Briek Wall. Figs. 35, 36. Flemish Bond. 1½- Brick Wall. Figs. 37, 38. 2-Brick Wall. Figs. 37-40 give the same information for 14-inch and 18-inch walls in Flemish bond. There is a peculiarity in the bond of these walls which was noticed but not illustrated in Part I. It will be seen that there are no false headers in the face. Every header is a whole brick : this makes stronger work, and causes fewer splits in the wall than the ordinary single Flemish bond illustrated in Part I. When splayed jambs are to have linings, they may be built with square offsets, as in Figs 41, 42.